That Illinois is now the most populous inland American state, and Chicago the greatest city of the American heartland, is directly traceable to the 96 – mile canal that linked the Great Lakes to the Illinois and Mississippi rivers. 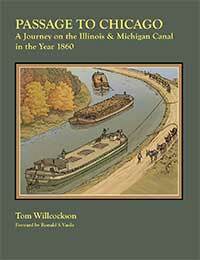 The Illinois and Michigan Canal is one of the best-kept secrets of American history. Though few know today how important it was, everyone here knew it a century and a half ago. We cannot know Illinois’ history without understanding how the Canal, as a symbol of the continent-straddling ambitions of America, made it possible for a great civilization to arise here. The Illinois & Michigan Canal stretches 96 miles, connecting Lake Michigan to the Mississippi River via the Illinois River. When the I&M Canal opened in 1848, it was the final link in an all-water route connecting the Atlantic Ocean to the Mississippi River. The canal, designed to be 60 feet wide and 6 feet deep, drops 141.3 feet between Chicago and LaSalle and consists of 15 locks, 4 feeder canals (Calumet, DuPage, Kankakee, and Fox) and 4 aqueducts. Commercial traffic on the canal utilized 9 canal basins, 12 widewaters, sundry backwaters, 3 lateral canals, and 2 hydraulic basins. Eleven significant towns developed along the I&M Canal, six of them founded by the canal commissioners, including: Ottawa, Chicago, LaSalle, Lockport, DuPage/ Channahon, and Morris. The I&M Canal was the final link in a national plan to connect different regions of the vast North American continent via waterways. 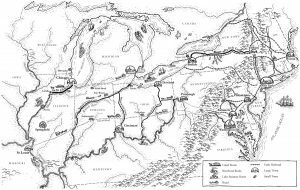 Linking the waters of the Illinois River (and ultimately the Mississippi River) with those of Lake Michigan, the idea of the canal went back to Louis Jolliet and the early French fur traders of the 1670s. The years between 1800 and 1850 have been characterized as the Canal Era in U. S. history. Since the birth of the new nation, American leaders recognized the urgent need for a network of internal improvements to ease the problem of continental transportation. The success of the Erie Canal, completed in 1825, marked a period of intensive canal building in the U. S. This chapter in our nation’s history has been largely overlooked, as most historians have focused on the railroads as the prime force behind America’s economic development. Construction of the I&M Canal and the sale of canal lands brought thousands of people streaming into northeastern Illinois in the mid to late 1830s, and those who braved the hazards of this frontier outpost quickly realized the necessity of improving transportation. Contemporary accounts of stagecoach travel emphasize the perils and discomforts of traversing rutted paths that passed for roads. Much of the region consisted of wet prairie, and spring rains and melting snow turned the trails into quagmires. On its completion, the I&M Canal created a new transportation corridor. By connecting the waters of the Illinois River with those of Lake Michigan, a vast all-water route connected widely scattered sections of the United States, specifically the Northwest, South, and East. Travelers from the eastern U. S. took the Erie Canal to Buffalo, New York, where steamboats brought them through the Great Lakes to Chicago. Transferring to canal boats, a 96-mile trip on the I&M Canal brought them to LaSalle/Peru. Here people boarded river steamers bound for St. Louis and New Orleans. The canal opened the floodgates to an influx of new commodities, new people, and new ideas. The I&M Canal, and the railroad and highway connections that soon paralleled its path between Chicago and LaSalle/Peru, became the great passageway to the American West. The opening of the Illinois and Michigan Canal in 1848 made Chicago and northern Illinois the key crossroads of the American mid-continent. The opening of the canal heralded a new era in trade and travel for the entire nation. The I&M Canal allowed travelers the option of taking an all-water route from New York Harbor to Chicago, Illinois, to St. Louis, Missouri and even to New Orleans, Louisiana. This water highway provided a mud and dust-free alternative to overland travel. 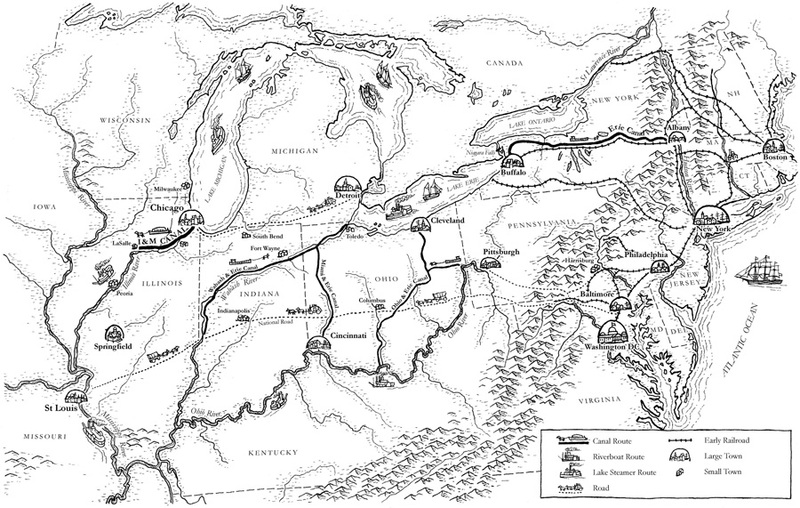 Passengers increasingly chose the all water route to the West, bypassing the Ohio River route. Freight could go from St. Louis to New York in 12 days via the I&M Canal and the Great Lakes, while the Ohio River route might take 30-40 days. Understanding the story of the I&M Canal is critical for understanding the incredibly rapid development of Chicago and Northeastern Illinois in the nineteenth century. The first few years of the I&M Canal were critical in launching Chicago on its path to urban greatness, and in spawning a dozen other towns along its banks that would soon industrialize and help consolidate the western end of the American Manufacturing Belt in northern Illinois. The opening of the Illinois & Michigan Canal radically reduced the costs of transferring goods, particularly grain, lumber, and merchandise, between Midwestern prairies and the East via the Great Lakes trading system. The degree to which the I&M Canal forever altered life in Chicago cannot be overstated. For the first time, the canal allowed goods from the southern U. S., including sugar, salt, molasses, tobacco, and oranges, to be shipped to Chicago. By cutting travel times, the I&M Canal also precipitated a new era of travel for people between the south to the north.